Burts did have plain flavour colour coded bags just like market leaders, Kettle Brand. The update is among the best Crisp bags designs we have seen. Each flavour has a different coloured apron and each cook, standing with hands on hips, has a matching shirt. The brand name is nicely sized, and although we would prefer the all important flavour was given more prominence, this design is as good as any. However, as this is a kind of standalone partnership Crisp, it separates itself by the giant and impressive logo, plus the golden glow of the potential contents. We think it would have been better designed by having a black apron and a creamy shirt to stay within branding. Maybe the apron could have had a little harp badge, maybe even a couple of the old Guinness toucan badges. At the very least, the top of this design should have finished in a creamy head colouring. As these were relatively thickly cut Hand Cooked Potato Crisps, the crunch was a familiar, firm, brittle, almost hard munch. Not just at the beginning, but right through to the end of the poor little potato slice's life. There were lots of oil boils in a bag of mostly whole and medium sized Crisps. There were a lot of greasy looking brownish coloured bends, shapes and irregularly cut potato slices. Crisps cannot look much more interesting than this. Unlike most reviews, we attempt to take personal opinion out of ours at Chips & Crisps. We prefer to analyse the flavour description on the packet and compare them with their peers. I add this here because I do not particularly enjoy Guinness. However, I had half a pint with these just to compare (yes, I know, just half a pint!) As there are no peers to compare this flavour with, it is just left to the worthiness of the bag description. And yes, there was a sort of stout flavouring. Maybe even a Marmite, beef stock taste, but it did not mimic the essence of the accompanying drink. However, a paradox was presented. A pint of lager followed and there were some Crisps left over. They then tasted a bit like Guinness! 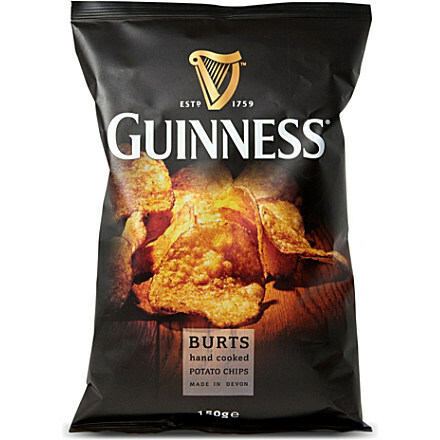 Perhaps that is the real revelation: They taste a bit like Guinness unless you can compare directly.